For those who either have poor memory, or just weren't paying attention! 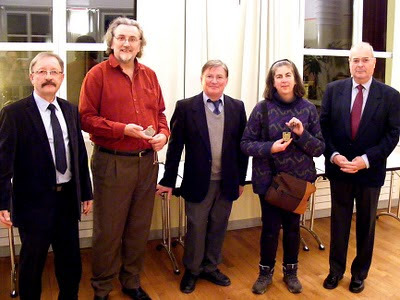 We were given medals by the town, had a party to raise funds for flood relief in Australia, blogged for a whole week about Australia because it was Australia Day on the 26th and I wrote about my family emigrating to Australia in 1966. 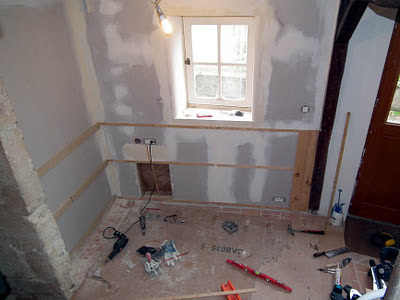 In the house we were insulating and plasterboarding the kitchen. We went to Retromobile and did some shoe shopping (as you do). In the house we continued work on the kitchen and applied some finishing touches to the structural work in the attic bathroom. 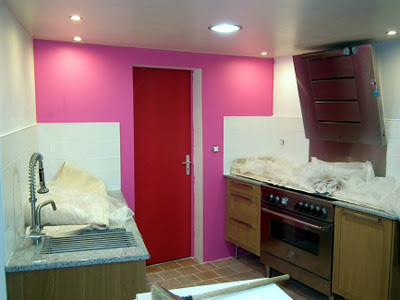 In March we started getting really serious about the kitchen, ordering our tiles, having the pipework for our cooker installed, and visiting kitchen shops to start getting prices. We also started proper work for the year, visiting Chenonceau for the first time on the 24th. 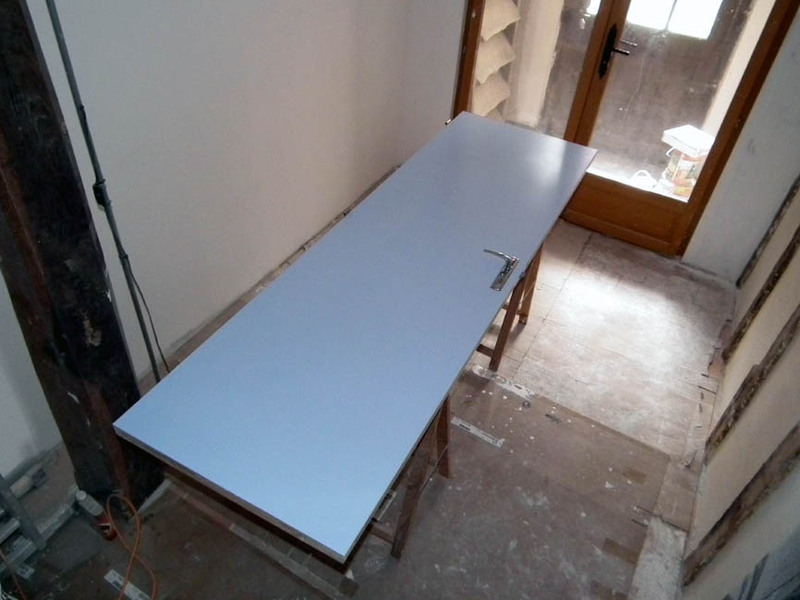 was paint and plaster month. 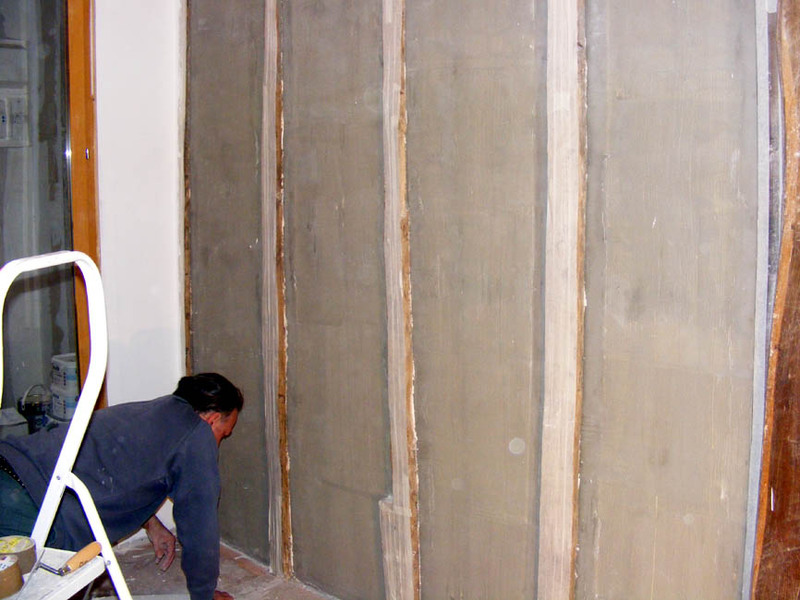 We worked on the office, the kitchen and the attic bathroom. We had time off though, for bar-b-q-ing (I know, but however you "spell" that, it's wrong) and the Fête. The kitchen kind of progressed when Angela and Dennis delivered our range hood and we decided not to use a kitchen specialist because they are for the most part thieves and rogues. Elsewhere (by that I mean outside) it didn't rain. May was the month where we celebrated the 5th anniversary of seeing the house for the first time and the second anniversary of moving here. 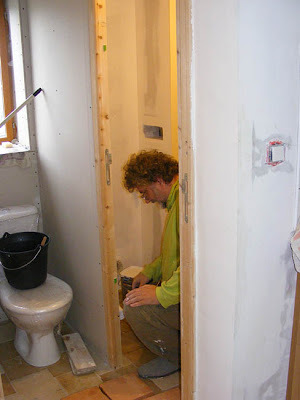 We did more plaster & paint stuff in the attic bathroom and kitchen, although we did get professional help too. All the while the drought continued. What a month - Paris, parents, bathroom, and kitchen, in various orders. Some even more than once. In between all that, we worked, and the drought continued. Parents again, but this time in Preuilly. The kitchen was installed (sans worktops). We worked lots. It was hot a lot of the time - and very dry. 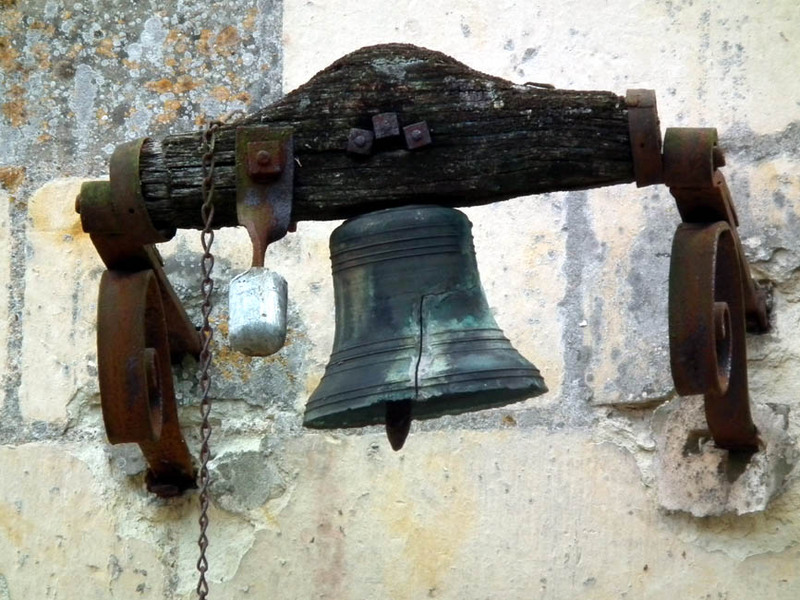 A bell on the side of Montresor chateau. It rained - eventually, and we continued to work hard with Célestine. We didn't get much work done on the house, as August is when businesses close around here. This meant we had time to watch some competitive ploughing, part of the Comice Rural. Work on the house involved paint (again) and fixing the landings for the staircase. September was a busy month with clients, but we did find time to fit in a weekend in Paris. 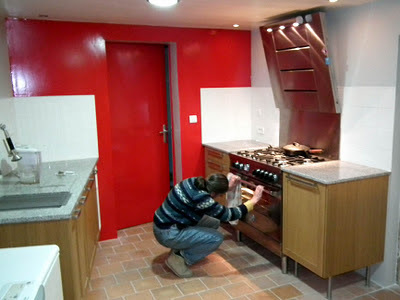 Suddenly life got really busy again - we did tiling, painting, chaux chanvre, and the worktops for the kitchen arrived. We were also blessed with more clients (so that was Chenonceau again) and a visit from a dear friend. it obviously deserved the ! found us still dealing with chaux chanvre, but we did also find time to install our niche. We had more clients, but then Célestine broke. I also had a couple of days in London with my father. A lot happened this month, mainly paint based, but we also got the kitchen and dining room more or less finished. The downstairs toilet was also painted and reinstalled. Then we had a storm, which didn't affect us too badly, but other people suffered. This is a somewhat random natural history post because we are struggling to find things to blog about without getting really repetative at the moment. I am engaged in cataloguing my natural history photos for the year and updating Loire Valley Nature, and this nice little frog came up in April's photos. Amphibians are not my principle interest, although I did do a university module on Reptiles and Amphibs and I quite like them. At the time I took the photo I didn't bother checking it for a definite ID, but just filed it under Rana sp assuming it would turn out to be a Common Frog Rana temporaria. 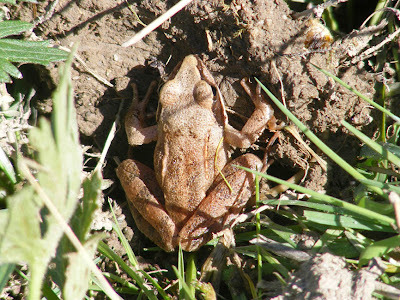 Since Common Frogs do not live up to their name in this neck of the woods I would have been perfectly happy with that. Anyway, now I have studied the photos I realised that the frog in the pictures has too pointy a snout to be a Common Frog. I checked HerpFrance to see what the other possibilities where and from there realised that I had an Agile Frog R. dalmatina. This species is also uncommon, and like all amphibians in France is protected. I've realised that from time to time I encounter Agile Frogs in the grass in fields and woodland clearings, just like this one in the Brenne. They often live a long way from water, typically in mixed broadleaf forest, and are tolerant of hot dry conditions. They are called Agile Frogs because of their particularly long limbs, which can propel them as much as 2 m. For a creature that is only 6-8 cm long, that's quite a leap. You can read about the other commonly observed frogs of this area here. We have almost finished the downstairs toilet. I have to sort out some baguette (door trim baguette this time) and the little niches where we have the stopcock for the outside tap, but that's it. 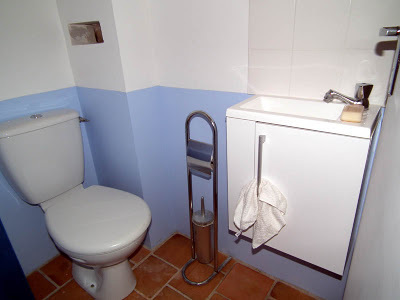 I am surprised (and maybe a little alarmed) to recall that the hand basin was a last minute decision, but this was mainly because space is at a real premium in there. We chose the absolute smallest unit we could find, and yet the door only misses the basin by about 1cm. 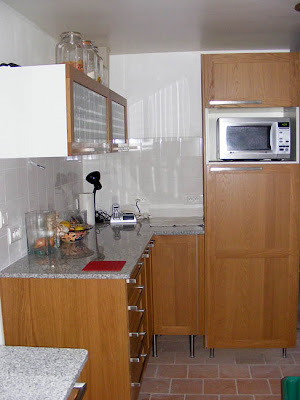 A corner unit would have been no good, either, as the door opens almost the full width of the room. Red tops mean full fat in France. And other mysteries explained. Hopefully. It's a tricky subject and even French people seem confused when you put them on the spot. This cream contains a seaweed based stabilising gel. As any anglophone expat or immigrant knows, cream is not just cream in France. In Australia there was just cream. When I moved to the UK I graduated to whipping, single and double cream. Easy enough. Whipping cream is for, you guessed it, whipping. Single is for pouring and double is for dolloping. to use this 'certification' on their products. Creme: must have a minimum fat content of 30% to be called creme or creme entiere. 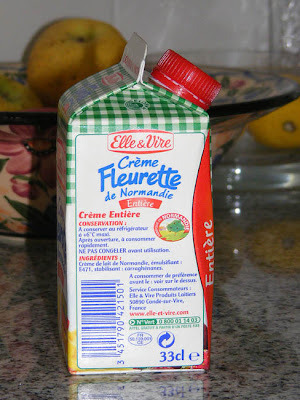 If the fat content is lower a product must use a descriptor such as légere or allegée or not use the word creme at all. Creme fraiche: always pasturised, and usually has a lactic culture added. This makes it ever so slightly sour tasting, lengthens its shelf life, thickens the cream and means it does not separate when heated. Its fat content is around 40%. Used for dolloping and cooking. Only found in the chiller cabinet. It is not the same as the anglophone sour cream. Creme crue: always unpasturised, but otherwise as above. This is what I generally buy, as my laitiere delivers it to the house. 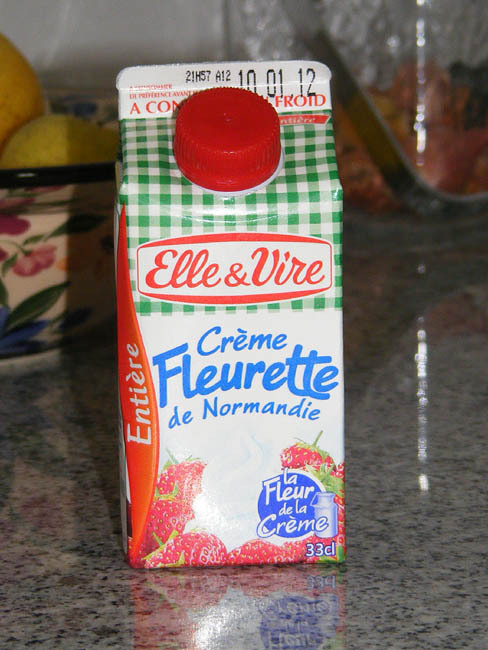 Fleurette: originally the cream that rose to the top of the milk, but it has been adopted by the dairy industry to indicate cream that does not have a lactic culture added. There are no rules about its use, so read labels carefully before buying. It can have a fat content as low as 5%. Usually creme fleurette is 30-35% and used for whipping, fleurette is 20% and used for pouring, creme fleurette legere is 5-15%. It often contains stabilising gels. 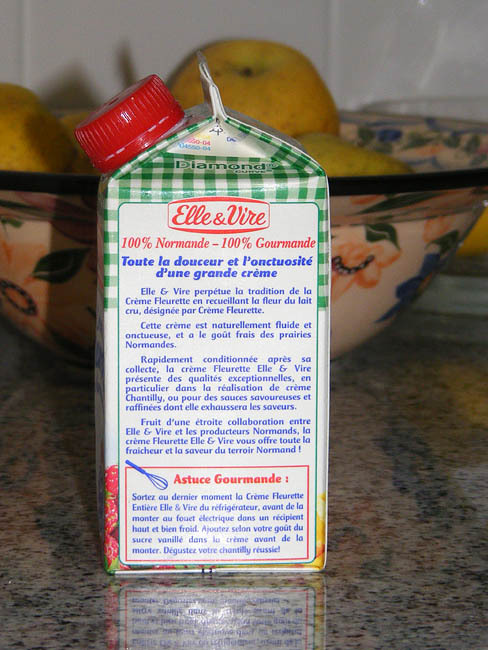 Liquide: pasturised or UHT cream that has a fat content of at least 30%, and has not had a lactic culture or thickener added. 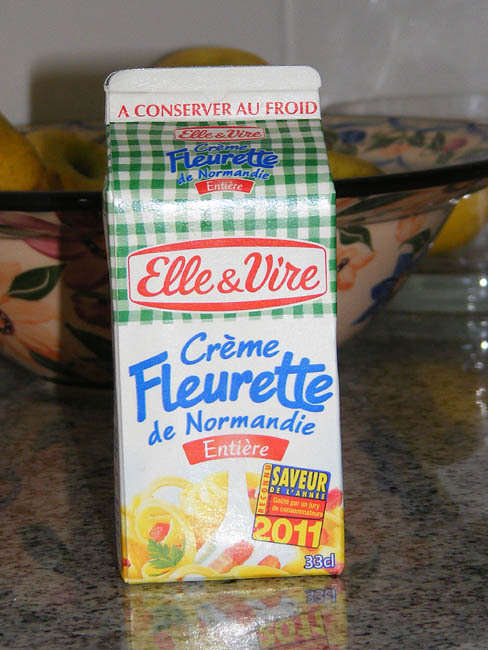 Often used synonymously with creme fleurette by cooks. 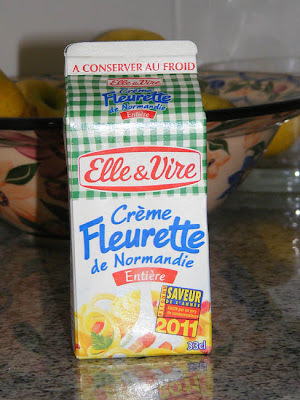 Fluide: there are no rules covering this term, but usually means creme fraiche with a lower fat content, around 30%. Epaisse: 'thick' or 'thickened', usually with a lactic ferment. Often used synonymously with creme fraiche by cooks. Can be found in the chiller cabinet or as a UHT product. Légere: 'light', products with a fat content of less than 30%, usually somewhere between 15% and 5%. Chantilly: sweetened whipped cream flavoured with vanilla and stabilised with gums. You can buy packets of 'Chantilly mix', which contain the sugar, flavouring and stabilisers to add to your creme liquide / epaisse / fleurette for whipping success. the fridge at the last minute before whipping. 1. Use a big enough bowl because the cream will double in volume. 2. Use a creme liquide with a fat content of 30%. A creme légere does not have enough fat to hold the air bubbles, a richer cream will not make much volume. 3. Everyone agrees the cream must be well chilled and if you are feeling really serious, put the bowl and the whisk in the freezer for 15 minutes before you start. 4. You can use cream with a higher fat content, but add 15% milk to thin it down. That's about 2 tbsp per 250ml pot of cream. 5. If you sweeten with icing sugar you can add it at any time. If you sweeten with granulated or castor sugar, add it at the very beginning to ensure it dissolves completely. Sugar added at the end allows you to add a little less, and results in a less yellowy coloured whipped cream. 6. 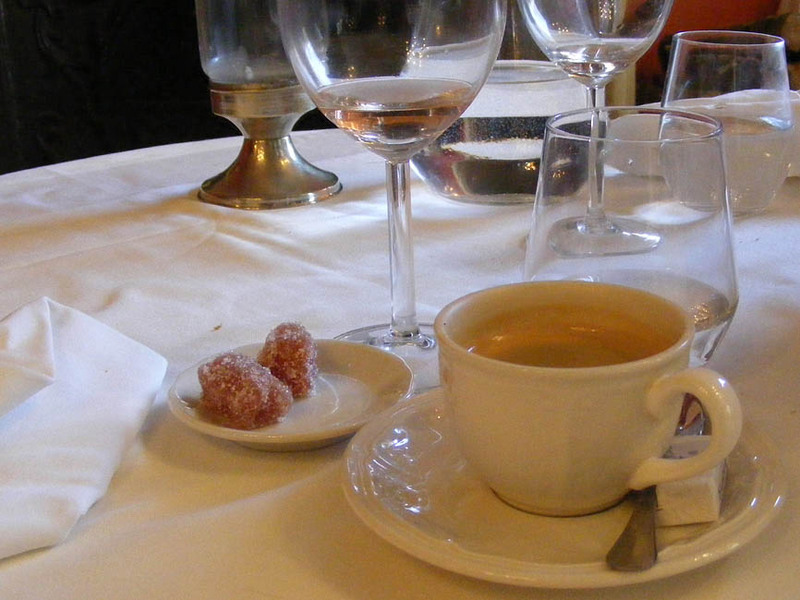 French chefs habitually add stabilising gums such as a pinch of gum arabic or tragacanth at the end, but the sugar also acts as a stabiliser, as does chilling. 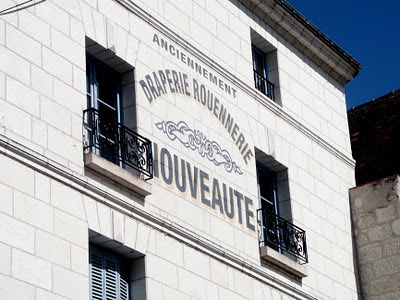 For details of our private guided tours of chateaux, wineries, markets and more please visit the Loire Valley Time Travel website. We would be delighted to design a tour for you. Socks for Christmas are supposed to be the last resort of those who need to buy a man a present and have no idea what to get him. I, on the other hand, like socks, especially thick woolly ones that I can wear inside sturdy boots, and frequently request socks for Christmas. This year it is my friend Margaret who has obliged. Not only has she sent me socks, but she knitted them herself. Since she is quite a serious knitter she also included the labels from the balls of wool. These were quite illuminating. These socks, and the accompanying scarf (also lovely) have been around a bit, back and forth, bouncing between Europe, Asia and Australia. Or at least, various stages of their development have been. The label doesn't say so, but my guess is that the wool was grown in Australia. Much of the world's wool is, even today, especially the very high quality stuff. But very little is processed in Australia. The superfine often goes to Italy where it is woven and used by the high end fashion industry. This knitting yarn was spun and dyed in China and Turkey, then sent back to Australia to be balled, labelled and distributed. 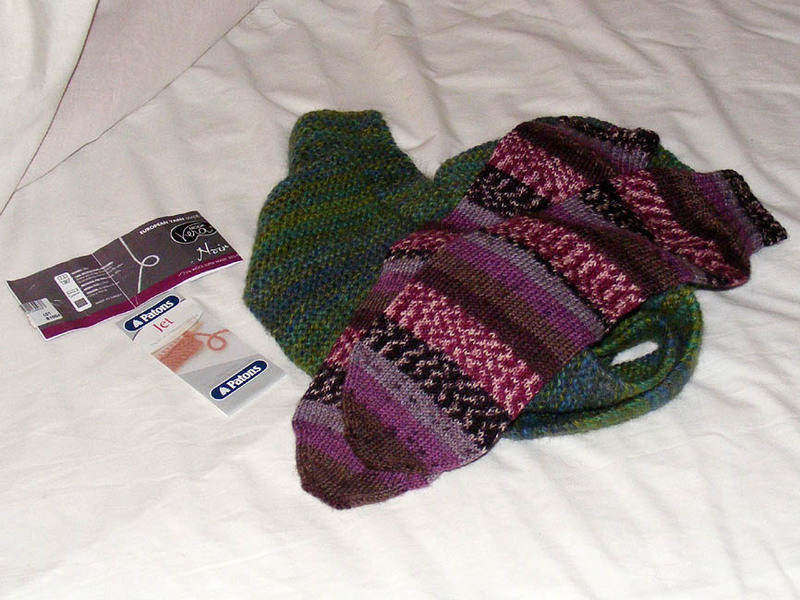 Finally, Margaret knits it up and sends it on to France. Yesterday we used our newly finished dining room for the first time. For a scrolly-rolly thing of the dining room, go here, then click the red button. A Merry Christmas to all of our readers. in both blog writing and house restoring. 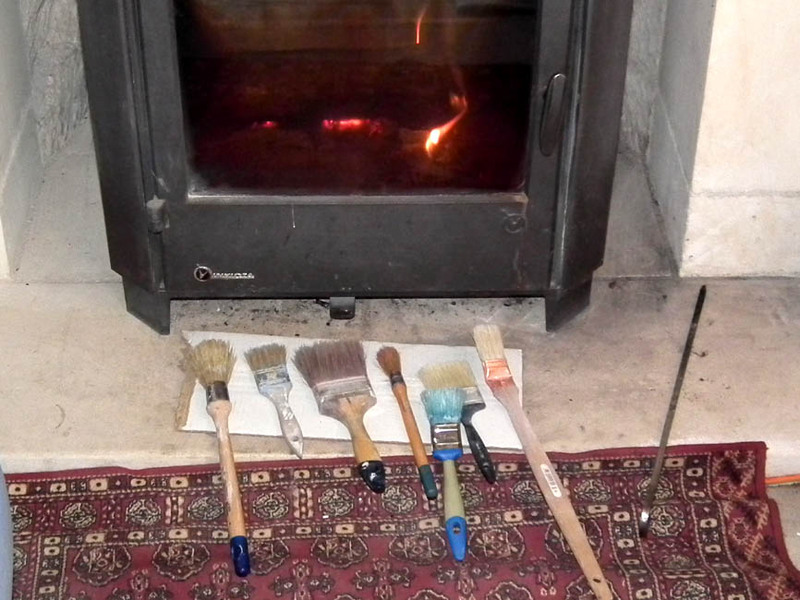 I said on Thursday that I was once again surrendering on the painting front and getting the man in to paint. This is not the cheapest of options, but it means that my temper has not been strained at what is for many people a difficult time of years for tempers. 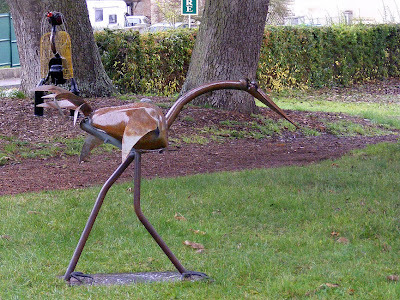 It also means that the job is finished, in a fraction of the time it would have taken me, and at much better quality. After installing the hotte we decided that it loomed too much and needed to be integrated more with the rest of the kitchen. 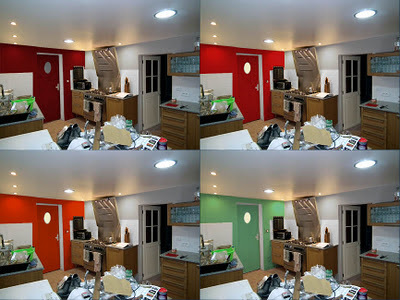 As we had already painted one of the walls of the dining room with a light grey tint I played around with photoshop to see what using the same colour would do to the kitchen wall. It certainly reduced appearence of being too imposing (we need to strike a balance here, imposing is good, over imposing is just ostentatious) so we decided to go with the grey. We had decided that we would try to match the colour of the dining room lambris to the lampshade we had bought. (Is that the wrong way round - chosing a lampshade and then having to match paint to it?). 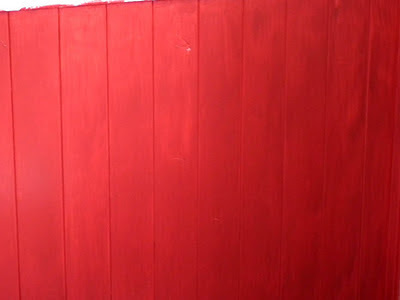 It was applying the red paint that bought on the sulk that has resulted in the job actually getting finished before Christmas. 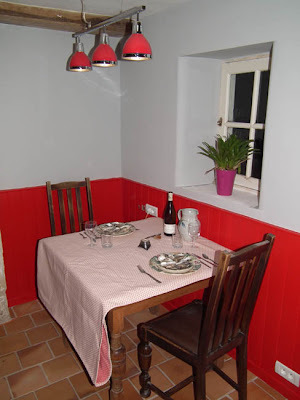 As we had red at one end of the room, it seemed natural to chose the same colour for the other end (the end wall of the kitchen). undercoat caused us to wonder if that was the right choice. So - Bruno arrived on Wednesday morning, and has been amazing. He has undercoated, sanded back, final coated and made no mess. Even more impressive is the fact he has only used about 1 metre of masking tape, preferring to work precisely and use his brush control. Finished - with dinner on the way. There is still work to do - the door and window frames need painting, and we have racks and shelves and under unit lighting to install. We also need the sink and taps installed. For a before and after shot, click here. A new window will pop up with a picture - there is a slider to make things even more exciting. 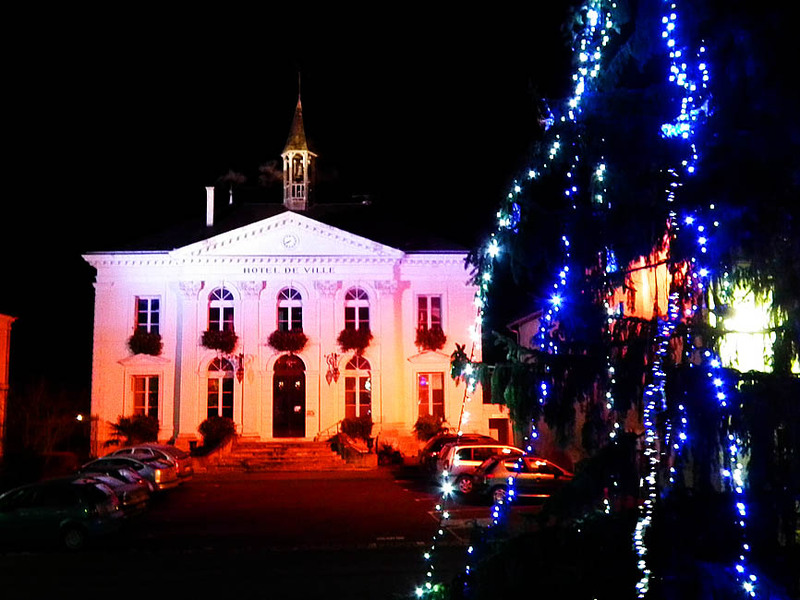 Here in Preuilly the storm named Joachim that came across from the Atlantic on 16 December was mostly a good thing. Following in its wake was more rain than we've had all year. Up to the end of November we had only had 80% of our average rainfall for the 11 months to that date. The advent of Joachim has probably sorted out the rainfall totals for the year to something close to normal. 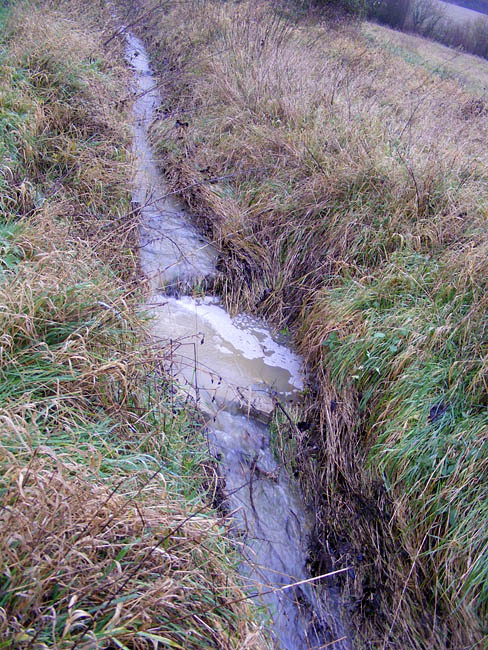 I can't remember the last time the stream in front of our orchard had this much water. In fact, I'm struggling to remember the last time it had any water at all! There has been a bit of localised flooding and a few trees were brought down, but better that than going into the new year with low aquifers and fragile drought stressed vegetation. Hopefully our drought has not been significant enough to cause the sort of worrying delayed reaction tree deaths that other parts of the world are currently observing. Of course, it's no use at this time of year in terms of watering the vegetables, but it will replenish the soil, give the trees some relief and the orchids will hopefully respond by putting on good leaf growth through the winter. The Bees, Early Spiders, Lizards and Pyramidals have been up for several weeks now, but even the Lady Orchids are poking their noses through the surface now. Last year they didn't appear until much later, well into the new year. There it is - I have said it. I REALLY hate painting. I don't understand how it is done, or how it works. What makes two cans of paint from the same manufacturer work differently? Why is it that the blue paint goes on nicely, doesn't run, covers perfectly, but the red paint is splotchy even after two coats, leaves brushmarks, and is totally frustrating. Both paints went on over two coats of exactly the same undercoat, with exactly the same brush. They are both "one coat" (ha!) water based washable satin paints. One is blue, one is red. One works, the other doesn't. This is why, taking into consideration the price of paint and the sheer frustration levels involved, I have stopped painting and have decided to GTMI. We have been promised a finished job by close of business tomorrow. If I had continued doing it myself I doubt if the bad language vocabulary would have been exhausted even on Friday next week. During the winter tropical fruit becomes affordable in France. Mangoes appear on the shelves (although they are almost always stringy and disappointing) and pineapples drop below 2€ a piece. Bananas, which are usually affordable but not good quality, improve so they are worth buying. The one fruit that I would quite like that I have only ever seen once in the supermarket here is pawpaw. I don't know why it isn't sold in French supermarkets. Passionfruit is intermittently available and always expensive, but usually good quality large soft skinned varieties. 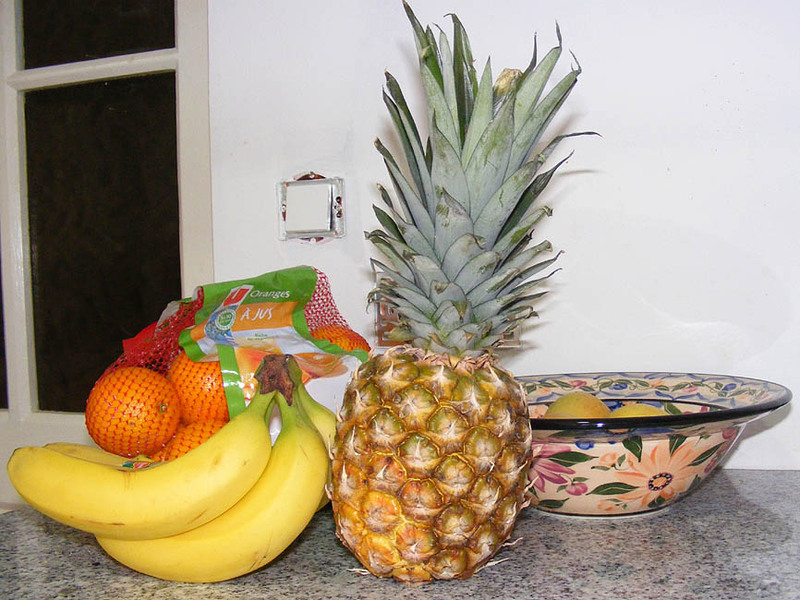 In the UK tropical fruit also became much more affordable in the winter time. I guess it has to do with these fruits being in season November to February in their place of origin. Curiously, bananas were good quality and affordable all year round there, and pawpaws (called papaya in the UK) when they were available were better quality than in Australia. This was mainly because they were a different variety, with pink flesh not yellow. The passionfruit situation was much the same as here in France. This fruit is all imported. Mangoes usually come from Kenya in the UK and Brazil in France, bananas from the Caribbean to the UK and from the Ivory Coast and Ecuador to France. Pineapples are from Ghana in the UK and Costa Rica in France. The passionfruit in Intermarché last week was from Zimbabwe and the only pawpaws I have encountered were €5.90 each! This is on a par with the pineapples at the market in Preuilly, which were being sold by the kilo. At €4.50/kg, it makes them about €7 each!! In Australia I lived in a state where all these fruits were produced, but I notice that the price difference for tropical fruit is not necessarily as much as I expected. 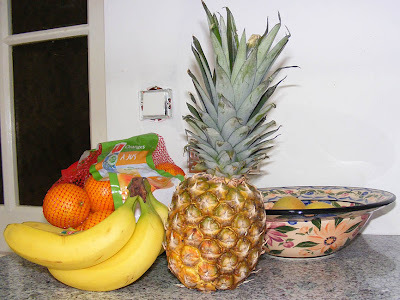 The pineapple in the photo cost me €1.50 at SuperU and the bananas €1.16 / kg. A cursory internet search revealed that I could purchase a pineapple in Australia for $2 (which is about €1.50) and bananas are predicted to come down to $1 / kg by Christmas (about 75 euro cents). I mentioned two weeks ago that my mother was going in to hospital to have a pacemaker fitted. Unfortunately she didn't make the surgery list that day, but she did make it today and has had the pacemaker fitted in two hours time. She is happy and chatting and will be home tomorrow (or tonight our time). 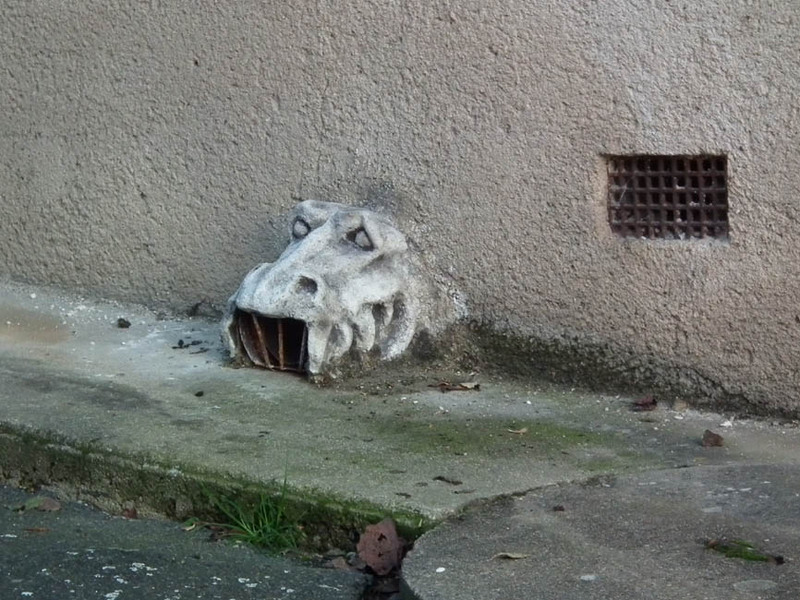 Spotted on the streets of Preuilly last week. I think there must usually be a car parked in front of the house, because I have never noticed these before. 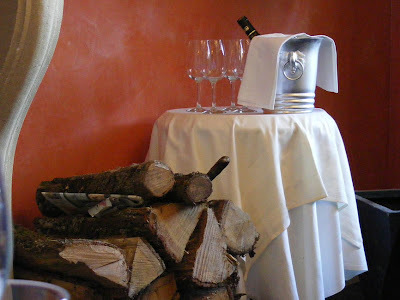 Yesterday was my birthday and we went to the Relais de la Mothe in Yzeures-sur-Creuse for lunch to celebrate. This is the first time we've been since the change of ownership and name. It used to be La Promenade and we were curious to see the results of the refurb and new chef. The changes start from the street - the very entrance is different. Instead of going in the front door you enter through the gate into the courtyard. The dining room is no longer on the street front but across the courtyard. 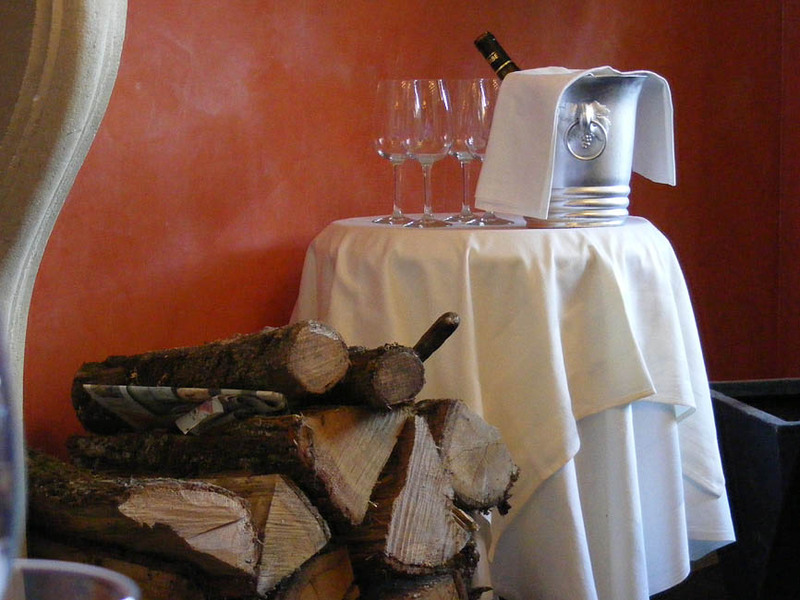 The decor is now updated to rich terracotta walls with a stone fireplace and interesting lighting. The tables and chairs are a pale French grey, the linen white and simple. But some things haven't changed. The waitress is the same person. Last time we saw her she wasn't a particularly happy bunny so the change of ownership appears to be agreeing with her. We chose the 19 euro menu. There being no house wines on offer, although we could order a merlot and a sauvignon from the Languedoc by the glass, we ordered a half bottle of Touraine Mesland Clos de la Briderie rosé. I was convinced I'd had this wine before and that it was a pinot d'aunis, but I had obviously mixed it up with something else. Anyway, it didn't go with my choice of starter at all, but went well enough with the roast guineafowl main. 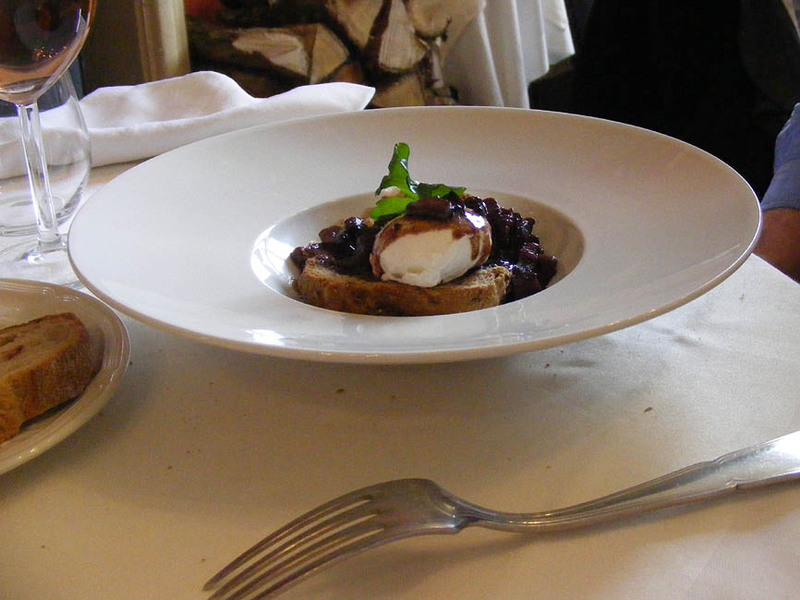 Poached eggs in red wine sauce with lardons and mushrooms. I had Ste Maure de Touraine goat's cheese served sitting on a caramelised apple ring and wrapped in brick to start. The chevre / pomme marriage was a very happy one. More often than not I don't like fruit and cheese combos but the apple was browned perfectly and made an excellent complement to the savoury chalky cheese. Simon had oeufs meurette, although that isn't what they were called on the menu, which is one of those where the dishes don't have names they have a list of ingredients. He reports it was excellent. Toffee pear and praline icecream. We both had roast guineafowl, which was served with crushed potatoes enriched with cream and subtly seasoned. This was very good, although like any anglophone I thought it would have benefitted by the addition of a green vegetable. Dessert for me was a poached pear covered in praline and a nut praline icecream. 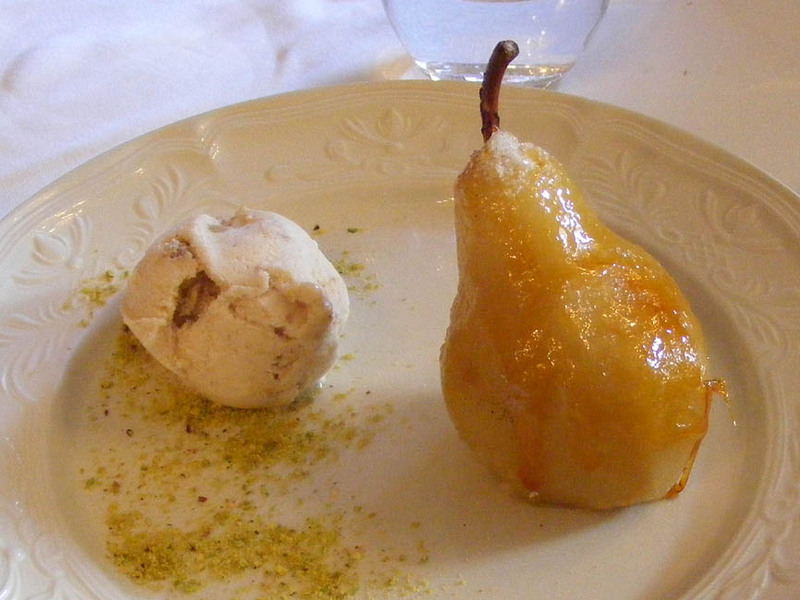 It looked fabulous, but sadly the pear tasted of nothing at all. The icecream was delicious though. Simon had tiramisu, which he felt hadn't got the right balance of cream (too much) to cake (too little). 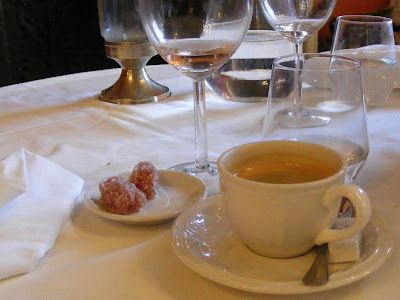 To round off the meal we had coffee, presented to us with a little plate of homemade quince cheese squares. I commented on these to the waitress and she said she had made them herself. I thought they were a very nice and creative alternative to the chocolate coated almond or speculoos you get elsewhere. As it happens I have 2 litres of quince puree in the fridge at this very moment, waiting for me to add sugar and boil it up into something that will set like stiff jelly and be a little Christmas time treat. 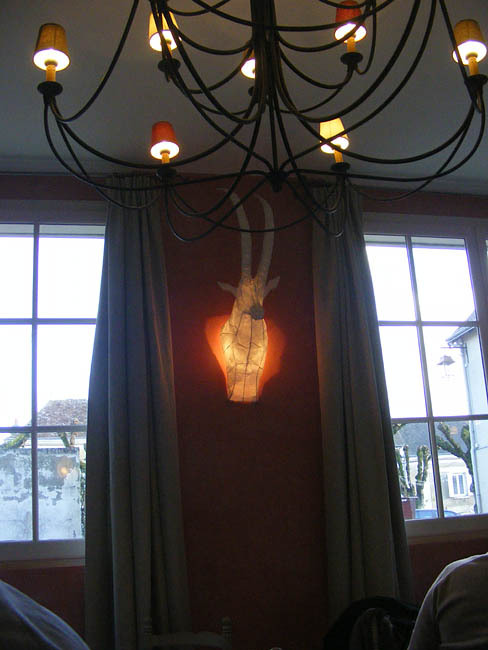 The wall lights are shaped like African animals. The total bill came to 50€ exactly and I thought it was fairly good value. The atmosphere is pleasant, the food is (mostly) good and it was nice to go somewhere new. The hotel part of the business is getting some good reviews (very nice bathrooms apparently) so I hope they do very well. It's the sort of place we will probably eat at every couple of years when we want to go somewhere other than our usual haunts. This has been repainted on a wall in Loches. The business is now a cafe, but it's nice to see history being paid its dues. Wall tiles are called faience in French. We chose really standard kitchen classic tiles - white 15 cm square, laid in a plain fully aligned pattern. Patrick did the work for us and they gave him a bit of trouble. The tiles are only 4 mm thick and rather prone to cracking if they needed cutting to shape. A number of times I heard 'Putain ! C'est pas possible !' which meant that a second attempt at cutting a tile to go around an electrical plug socket had cracked. He says they are fine once they are safely glued to the wall though. The finished tiles in situ. We used a white plastic edge strip to run along the top and cover the raw edges of the tiles. 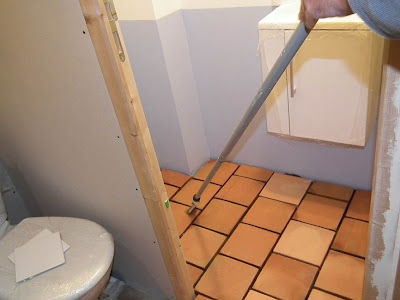 This seems to be how it is done these days, rather than use expensive bullnosed edge tiles. Hurricane Joachim: For those of you who read Ken and Walt's blogs, you will have noticed they didn't post this morning. We phoned them at 9am and they said they and the houses around them at the top of the hill don't have power. If the electricity isn't restored by lunchtime we will go up with our generator for them. We've had a lot of wind and rain (more than any other rain episode this year) and lots of little brownouts. We lost the internet for a couple of hours yesterday morning. No damage here in town that I know of though, unlike Xynthia in February 2010 when the streets were littered with roofing materials. The weather today is beautiful. 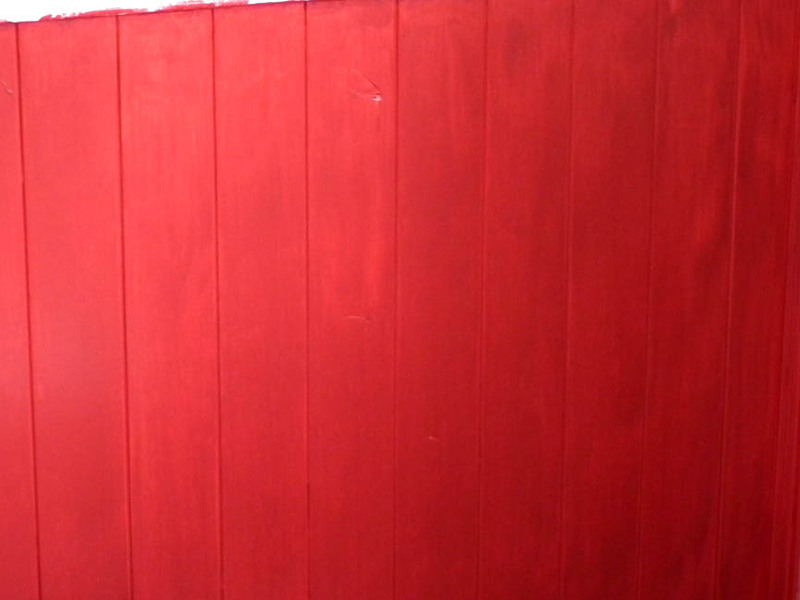 Simon has recently painted our downstairs toilet. He removed the toilet itself and the door to make it easier, but it was still a bit awkward. Nevertheless, he's done a really good job and the colour is very pretty. When it came to treating the newly laid terracotta tiles with Sarpasol there was an added problem. The tiles could not be walked on as Patrick had only laid them in the morning. We had to give them their first treatment the same evening, as he was returning this morning to do the chaux-sable grouting. Simon taped a brush to a pole and reached around through the laundry door. Not ideal, but the job's done. Building work has just about stopped for the year - Patrick arrives this morning to lay some tiles in the downstairs toilet, but that's it. This means that I can paint the parts that have been built during the past 12 months without too much dust being deposited on wet paint. There is a problem though: at this time of year daylight hours are short, and even when it's daytime it doesn't necessarily mean I can get brushes washed and dried between coats. In spring, it isn't so much of a problem, but rainy winter days require a different approach. So far the only painting I have finished is the downstairs toilet and the back of the toilet door, which have been painted in white paint - tinted a delicate baby blue. 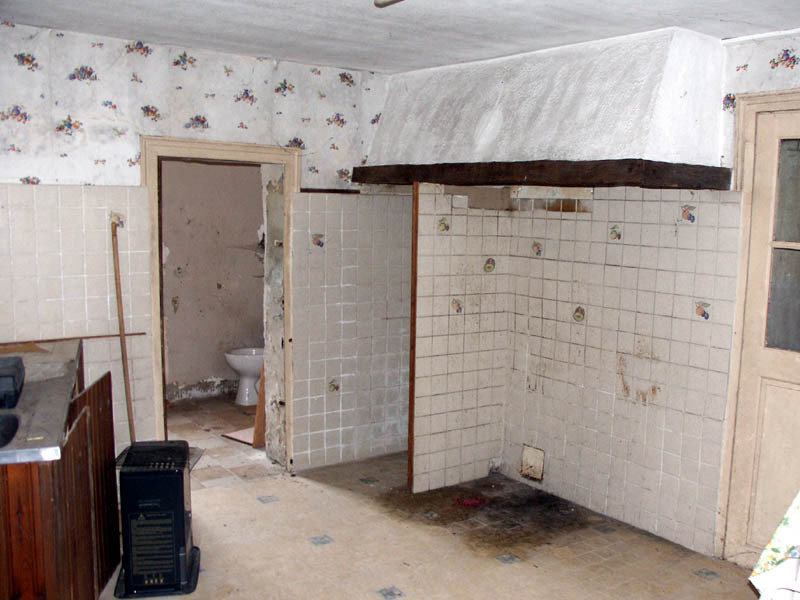 Photos of the room itself will no doubt follow once the tiles are laid and the furniture re-installed. I have a problem with the dining room - the undercoat on the lambris hasn't dried and is still tacky after two whole days*. I am hoping that another day's drying (and an electric heater in close proximity) will solve that, allowing me to get on with my winter task. *anyone with suggestions of how to get solvent based undercoat to dry can use the "comments" button, below. Boudin blanc is available all year round in markets and supermarkets and we've written about these tasty white sausages before, but since they are also considered a bit of a seasonal treat over the winter holidays, I thought I would post again about them. 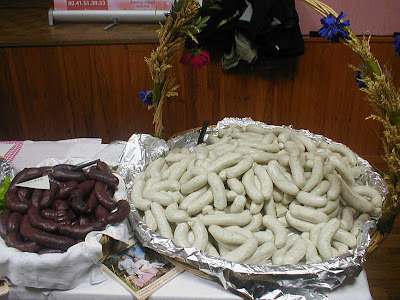 Boudin blanc to the right, boudin noir (blood sausage) to the left. According to serious boudin blanc afficionados, they should still be considered a seasonal product, best purchased in the period from November to Easter. These artisanal boudins are made by charcutiers who infuse diced vegetables such as carrots, turnips and fennel with parsley, cloves and maybe even vanilla beans in milk for a couple of hours. Pork shoulder meat is mixed with eggs, salt, pepper, nutmeg and white wine, cider or pommeau (a fortified cider), then the milk is strained in. After the sausages are extruded they are plunged into boiling water which is taken off the heat and the sausages left to sit in the hot water for 20 minutes. Artisan charcutiers scorn the use of breadcrumbs in the mix. According to one of the regional Confrérie des compagnons du boudin blanc (Brotherhood of Companions of the White Sausage - in other words, the trade association for boudin blanc manufacturers) the boudin blanc originated as a gruel of milk, breadcrumbs, fat, potato starch and sometimes ham or chicken which housewives would prepare at Christmas time. Everyone would then feast on it after midnight mass. An artisan charcutier's stall at a market in the wintertime. 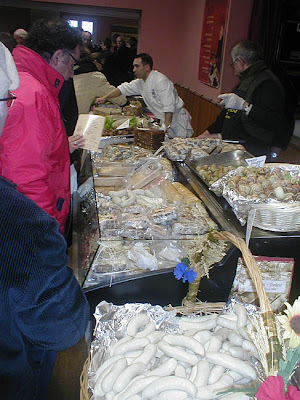 Modern recipes for boudin blanc vary from region to region and they are made all over France, but especially in the north. Some use lean pork, some use rendered fat or the cooked large intestine of the pig. Traditionally they are served with chestnuts, mushrooms or apples, depending on the region. And Dennis and Angela will be happy to read this. They very kindly brought our range hood over from the UK in their van back in April and have been teasing us about how long it has taken to get it on the wall and working. Originally we had hoped to get an extracting type that vented out through the old chimney. However that proved too difficult to achieve and we opted for the recycling kind, semi reassured by the manufacturer's blurb that the recycling kind are much better than they used to be. We needed a very specific style of range hood because our kitchen ceiling is rather low and Simon is rather tall. 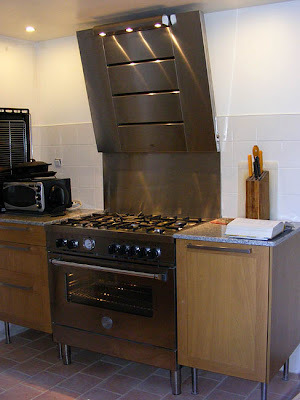 Most range hoods project horizontally over the stove, which would have meant Simon would have had to bend down underneath it to see anything on the stove top. We needed one that sat at an angle. 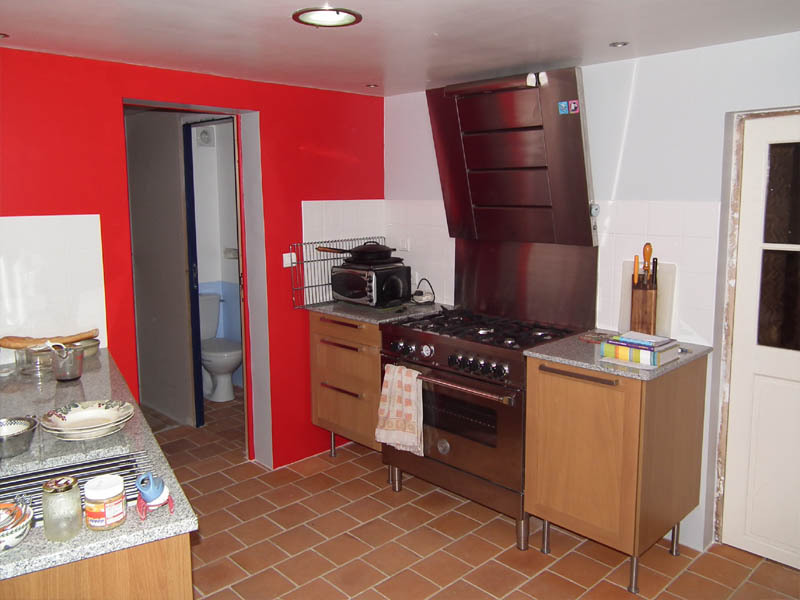 Unfortunately, this style are all the most expensive ones, and still have to sit a minimum distance from the stove top. Simon went into internet search overdrive and eventually found this AEG model that looked good, was the right dimensions and at a comparatively reasonable price in a shop in Birmingham, England. It was delivered to Dennis and Angela's in Essex and they brought it over. They arrived one lovely April day with an enormous box containing the hood and stayed to eat barbecued chicken with us. The day was memorable for me for another, less pleasant reason. I had managed to make myself really sick with sunstroke and dehydration planting out our potatoes, so I wasn't at my best. Finally, months later, we have got the stainless steel crédence in place and the tiling done. We were ready to install the hood. It was a bit of a struggle manoeuvering it into place with no wriggle room because of the ceiling. Stéphane gallantly arrived yesterday morning to help and to do the electrical connection, despite still running a bit of a temperature and suffering from the lurgy. The range hood looks good with Big Berta, and seems reasonably quiet. It has two light settings, indicator lights to tell you when the grease filter and charcoal filter need cleaning (both can go in the dishwasher!) and a 4 speed extractor fan. The top speed is already being referred to here as 'Warp Speed for Wokking'. I will be very interested to see how much difference it makes. I have noticed that the jars on top of the cupboards collect a thin film of grease within days. Hopefully having a range hood will prevent that. Unfortunately, it is not equipped to deal with steam and condensation, so I will still have to be careful about ventilation if I've got stuff boiling furiously. Another step towards a finished kitchen. Still to go is the question of what colour we paint the end wall, the putting up of racks and the return of the plumber to give us a functioning sink. Sending Christmas cards is not really part of the francophone world, but it has been the practice in the anglophone world since the mid-19th century. One of the most common motifs on Christmas cards was, and is, the European Robin and until recently, I didn't know why. I just assumed it was because it was a nice chirpy little bird, popular with gardeners because they can be quite confiding and tame. They have the added advantage of being quite brightly coloured, for a European bird, and of looking charming in seasonal scenes with snow and holly. Christmas card sellers have always had the bottom line in mind. However it seems there is another seasonal and cultural association. 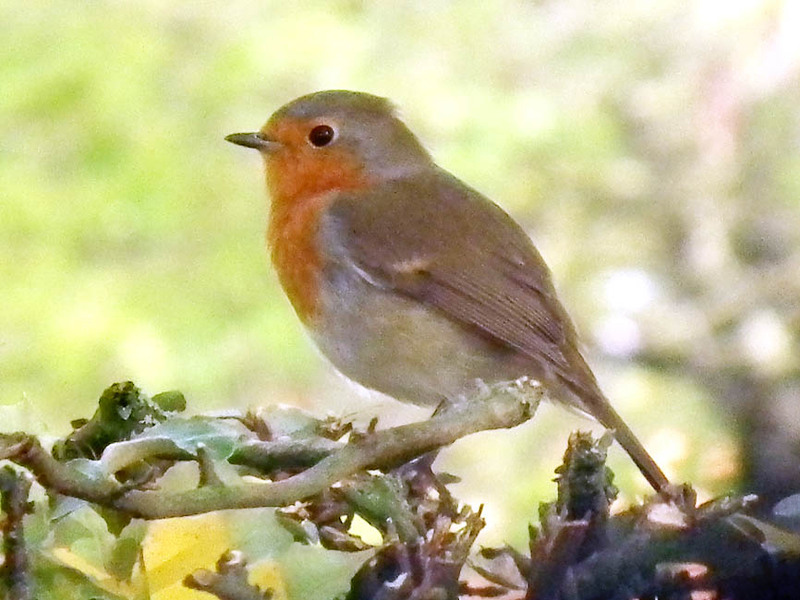 Postmen in Britain used to wear red uniforms and were nicknamed 'Robins'. By the 1870s the deluge of Christmas cards in the system was causing business men to complain about the interference to 'legitimate correspondence' and the Post Office took to appealing to the public to 'post early for Christmas'. It didn't help much and right up until the early 1960s there was a postal delivery on Christmas Day. Letters to Santa must be posted by 14 December. Last weekend there was an exhibition of sculpture in the arboretum opposite the médiathèque in Preuilly. 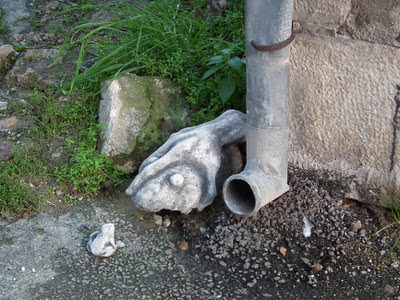 The work was by a Breton artist called Mich Mao. 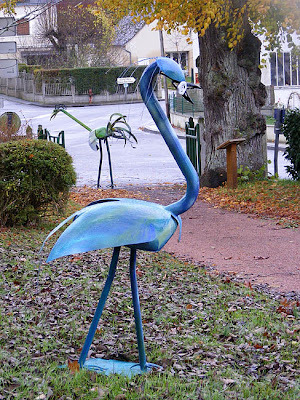 In French he is an artiste plasticien, which is a term used to cover the visual arts in general. 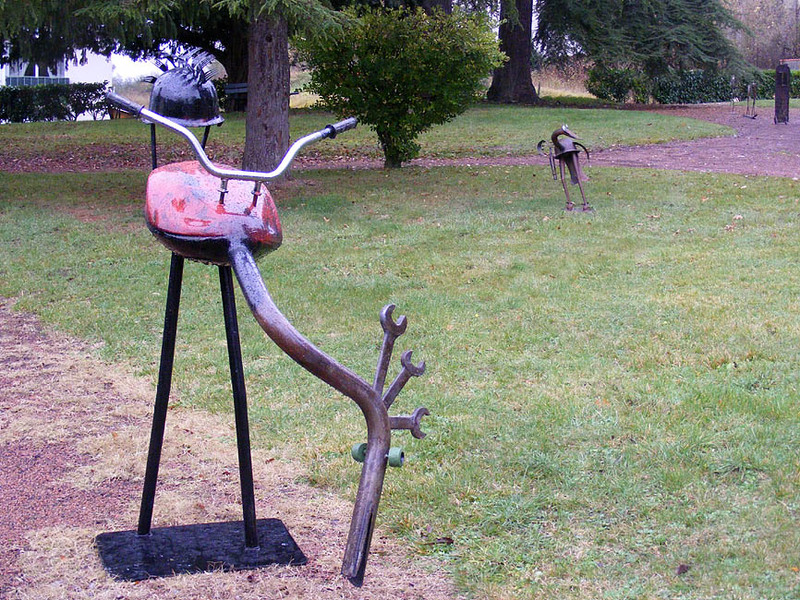 He works in metal, mostly using old motorbike parts for the big pieces and quite a lot of cutlery in the smaller tabletop pieces. 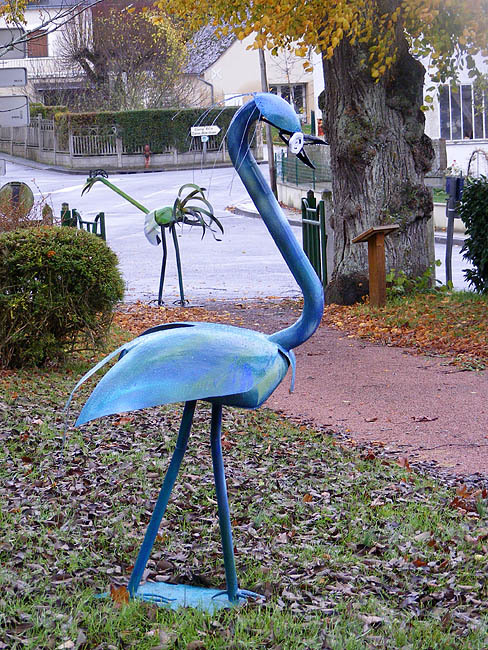 They range in price from €35 for a tabletop penguin to €5000 for the big bird in the gateway. Most of the large birds were €2-3000 though. I thought they were rather fun, and he seemed a nice guy. It was a miserable day when I visited and I was his only visitor that morning. I was tempted to buy a tabletop piece - I love recycled metal sculpture - but we have a combination of French house restorer's and classic car owner's Dwindling Funds Syndrome at present. This is a condition identified for us by our building surveyor some years ago. His next project takes him to one of the little islands near la Rochelle for 6 weeks. I don't think he is totally looking forward to it. He said it will be good from the point of view that it won't be bustling with tourists and interruptions, but being on an island on the Atlantic coast in the middle of winter isn't ideal. 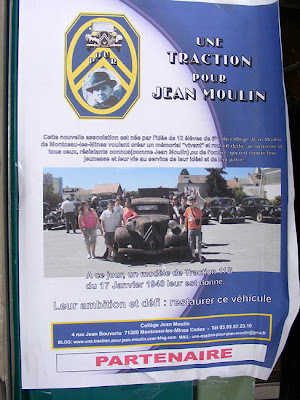 A Traction for Jean Moulin is the name of a project to restore a pre-war Citroen Traction Avant. The restoration work is being carried out by a group of 11-12 year olds at the College Jean Moulin in Montceau-les-Mines. Helping them with technical advice and donations of parts are Traction clubs, including the club we belong to, and enthusiasts from all over France. The Traction itself has been named Titine and was donated by our own Dr Traction, Jean-Louis. You can see a video of the kids' activities here and the president of the club that has been formed writes a blog here. Montceau-les-Mines was once a coal town, but when the mine closed in the early 1990s, the descent of the town into poverty and deprivation was immediate. The project is to create a bridge between generations and to encourage citizenship and respect for history whilst building confidence and teamwork. "This new club was born from the idea of 12 Year 7 students from Jean Moulin College in Montceau-les-Mines wanting to create a 'living', working memorial dedicated to the memory of all those, whether well-known Resistance members (like Jean Moulin), or in the shadows, who have given their youth and their life in the service of their ideals and their patriotism. Their ambition and challenge: restore this vehicle." Jean Moulin had already achieved prominence as the youngest ever préfet in France (CEO of a département) at the time of the Nazi occupation. He was well read, witty and artistic, and a significant player in the Resistance movement from the beginning. He was eventually betrayed, arrested, tortured and died in 1943. 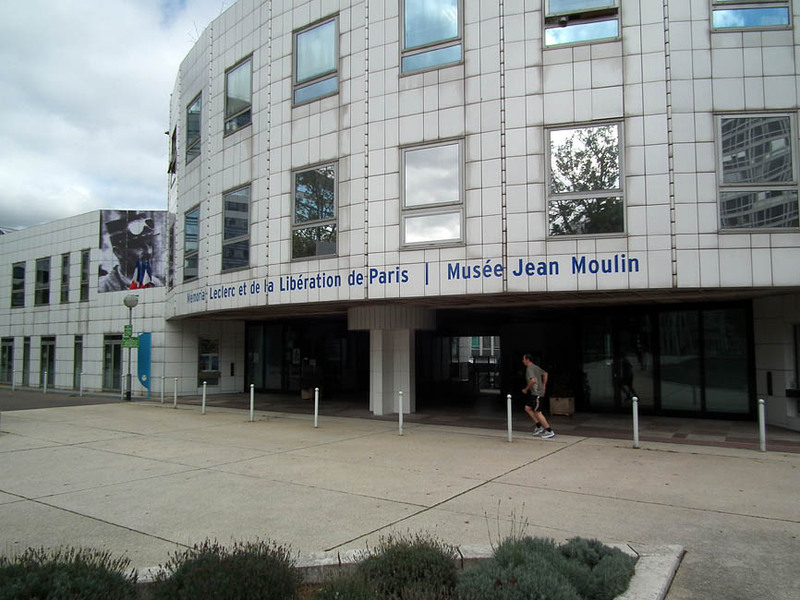 Jean Moulin is a household name in France and the image of him in his fedora and scarf is as iconic as that of Che Guevara. There is a museum dedicated to him on top of Montparnasse Station in Paris that we visited last time we were in the city. If you've got half an hour or so to spare while waiting for a train I recommend this museum. It's free and full of evocative newspaper clippings, photos and even some of Moulin's drawings. The walls of the staircase are almost but not quite finished. All we have left to do is the little bit under the stairs on the ground floor. 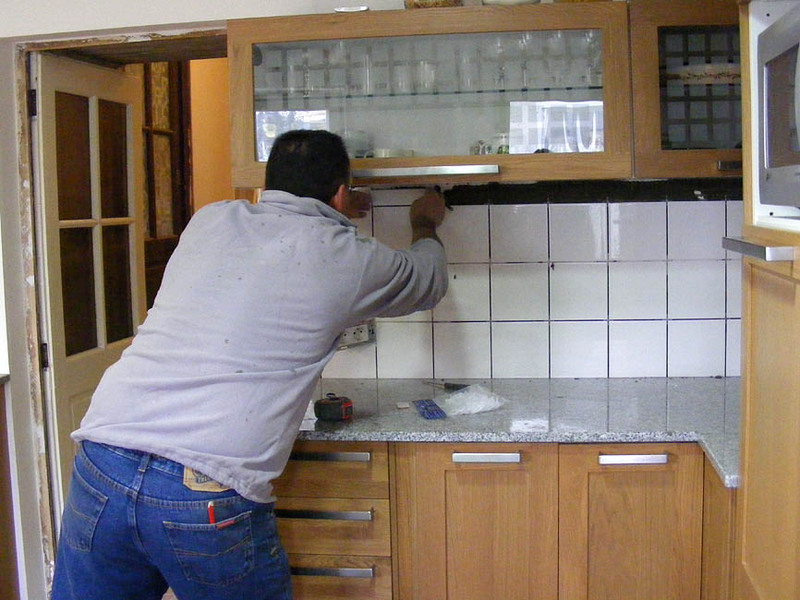 In the kitchen the wall tiles have been laid (do you lay tiles on a wall? If not, what do you call it? Glueing sounds haphazard, and "putting" even more so). Today Patrick returns to grout them, then we can put the range hood up. After that all that needs doing is a final coat of paint. Oh - and the sink and taps, which still haven't been installed. The dining area (too bijou to be an actual dining room) has been panelled with lambris. Painting is happening - the entry hall has been chaux-chanvre'd, so that, the dining room, the small (downstairs) toilet and the ceiling above the stairs are in the process of being painted. Once the ceiling above the stairs has been painted we can sand and varnish the staircase. With any luck, by Christmas we will have finished what we started. "All" that will then be left to do are the salon and main bedroom. 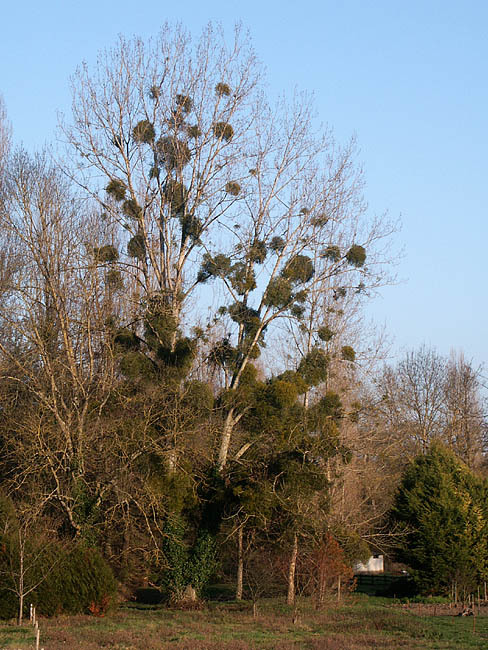 Mistletoe in a tree by the River Claise. 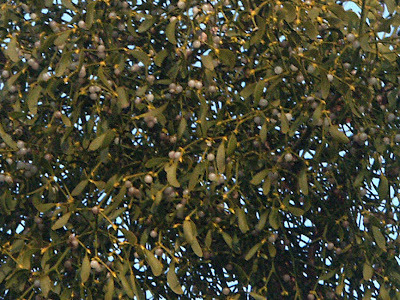 Mistletoe Viscum album is a parasitic woody shrub with leathery blunt tipped leaves. The flowers, such as they are, appear in the early spring, and are followed eventually by sticky white berries early in the wintertime. 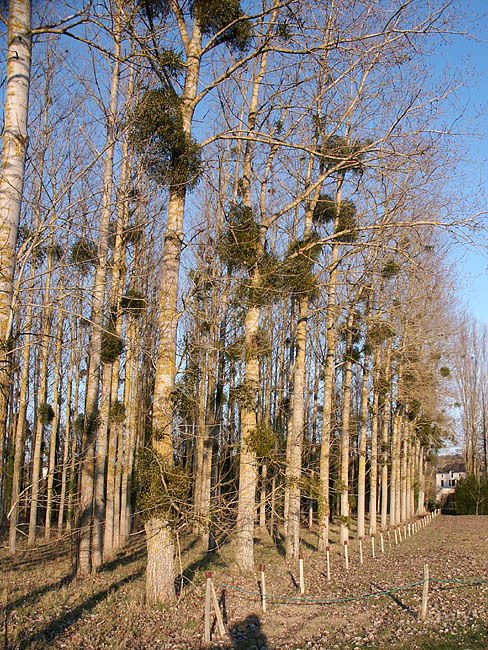 In a completely natural habitat, Mistletoe only grows along riverbanks or in open woodland, but the main habitat here is Poplar Populus sp plantations. 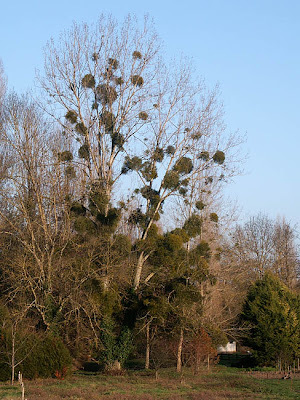 The parasite is not actually that fussy about host species but because of its requirement for space around the tree it is very much more common in orchards, gardens and plantations created by man with well spaced, domesticated trees. Mistletoe in a Poplar plantation. It is a lowland plant, seeming to require a climate with hot summers and cold winters. 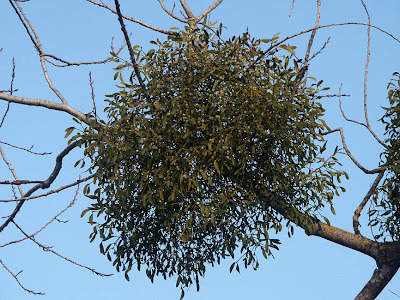 Unlike some mistletoes, V. album does not usually kill its host tree, although in abandoned orchards the lack of regular pruning can mean that the Mistletoe becomes so abundant the aging trees can no longer support it. A heavily infested tree will have reduced foliage of its own, have to compete for the available water and be subjected to considerably more wind rock. 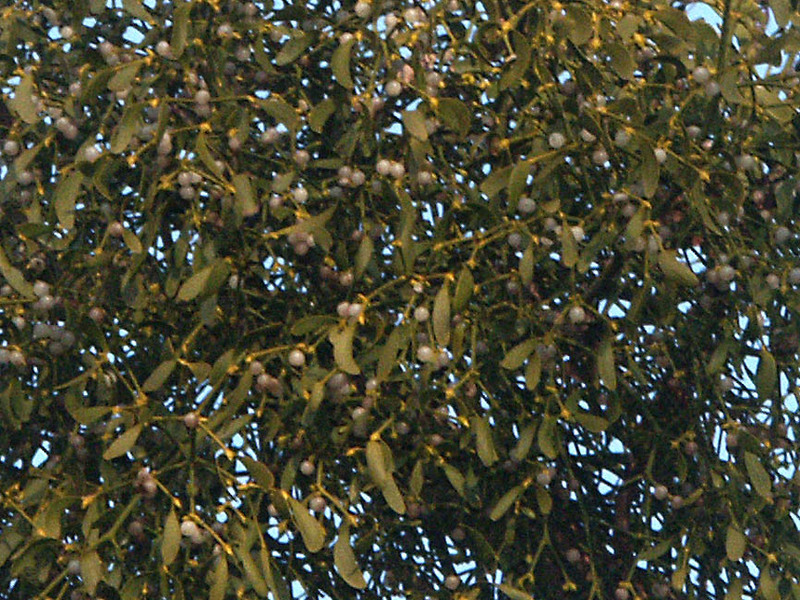 Even though few birds are attracted to the white mistletoe berries, birds are the main means the plant spreads. Thrushes such as Mistle Thrush Turdus viscivorus swallow the berries whole and excrete the seeds, along with some of the sticky pulp, about 20 minutes after ingestion. 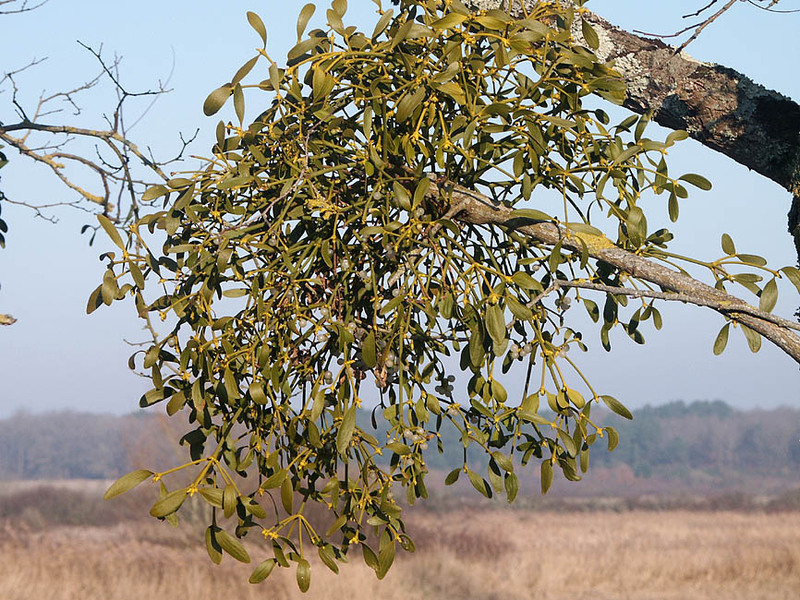 Some seeds stick to a branch where they can germinate, but most will hang down on a slimy 'thread', where they will dry out and die (see our previous post about Mistletoe). The Blackcap Sylvia atricapilla, a type of warbler, will also eat the berries. They manipulate the berries to remove the seeds before they swallow the pulp, wiping the seed off their bill onto a branch. This method means that far more of these seeds will germinate. Close up to show the berries. It is possible that the species will move north if European winters warm up due to climate change. More and more Blackcaps are now overwintering in Europe rather than making the journey to Africa, and they may be a vector for both pushing the distribution of the plant northwards and making it increasingly abundant. 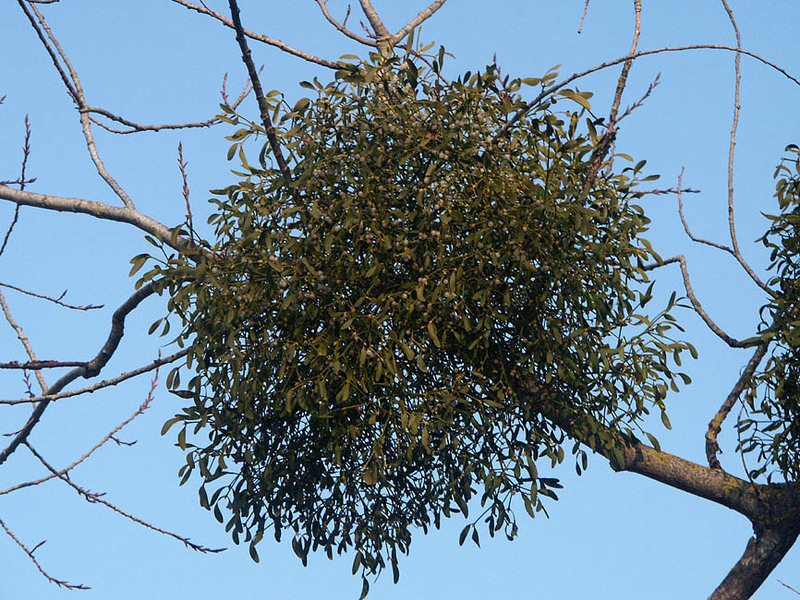 As yet the scientists say it is too early to tell if the change in Blackcaps behaviour is causing a change in the Mistletoe, but they are gathering data. 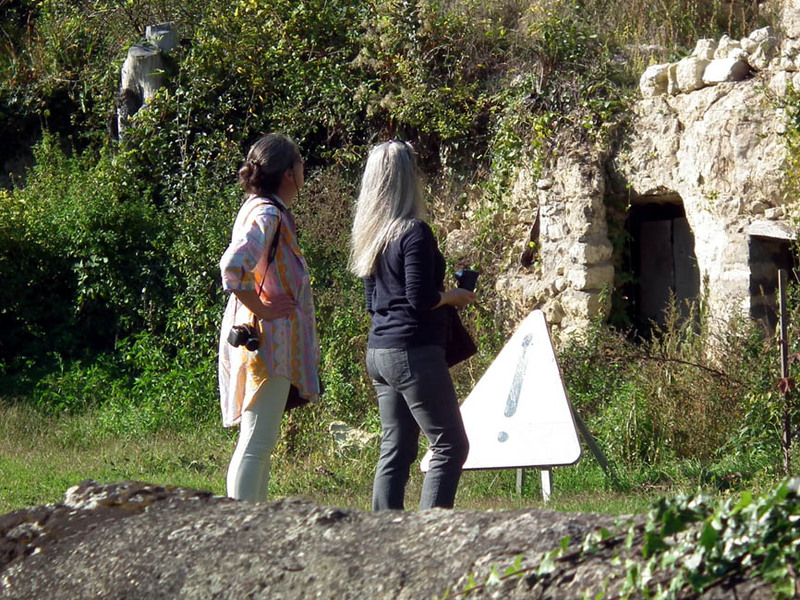 We started Loire Valley Time Travel in 2009, helping visitors explore the historic and fascinating Loire Valley in style. 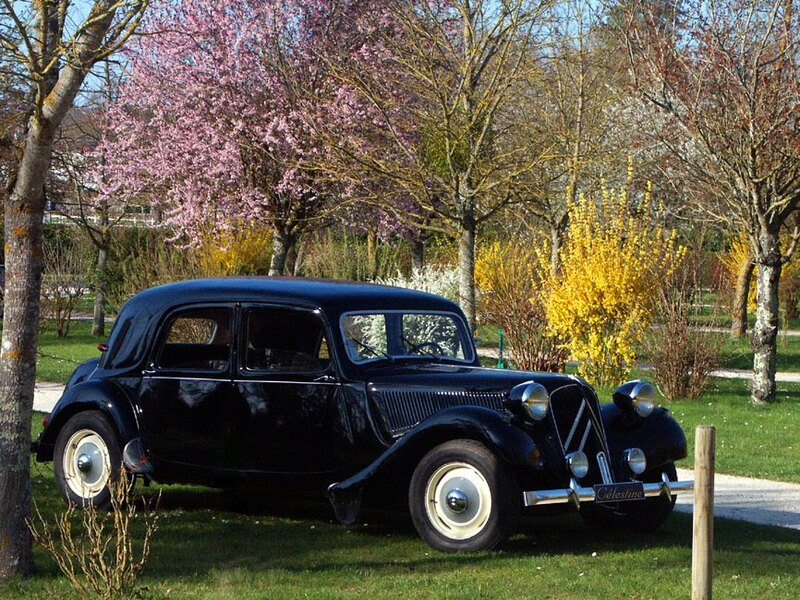 Book a tour with us in one of our classic 1950s Citroen Traction Avant cars. Susan was born in Victoria, but moved to Queensland when she was 11. Simon was born in London, but moved to Canberra when he was 7, and to Queensland when he was 28. In 1997 they moved to London. Susan worked for a large heritage and nature conservation trust and Simon taught music technology at tertiary level. 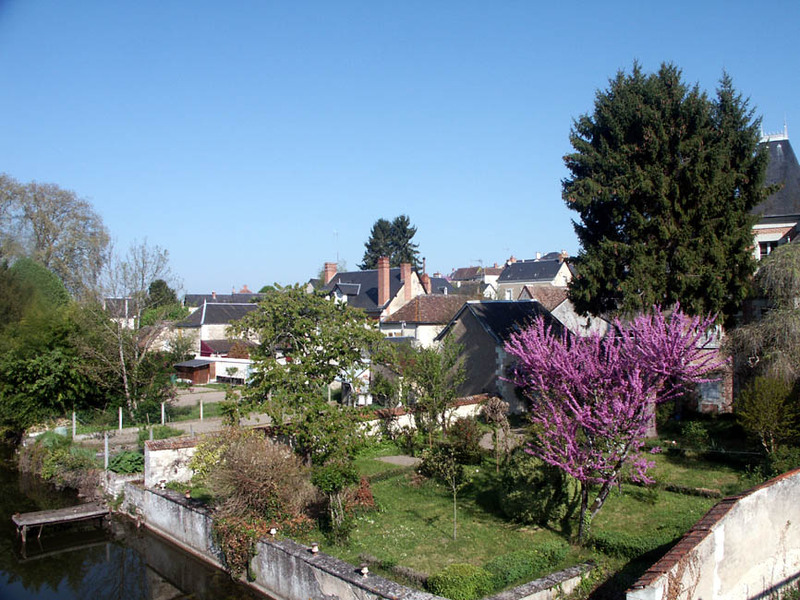 Now we live in Preuilly-sur-Claise, a small town with a population of less than 1000 people in the south of the Loire Valley. We write about the restoration of our house, the history of our local area, nature, cooking and anything else that strikes us as interesting. When we are not blogging we run Loire Valley Time Travel, doing individually tailored tours of the Touraine for anglophone visitors in our classic Citroëns, Célestine and Claudette. All the photos are taken by us unless stated otherwise. We are not paid for any links within the text of blog posts: if we link to another website in a post we have written it is because we think readers might be interested in further information. All content on the blog is original and copyrighted to us (unless stated otherwise) and permission must be sought if you wish to use any part of the text or photos. We can be contacted by email via our profile links below. If you have a question, feel free to ask.